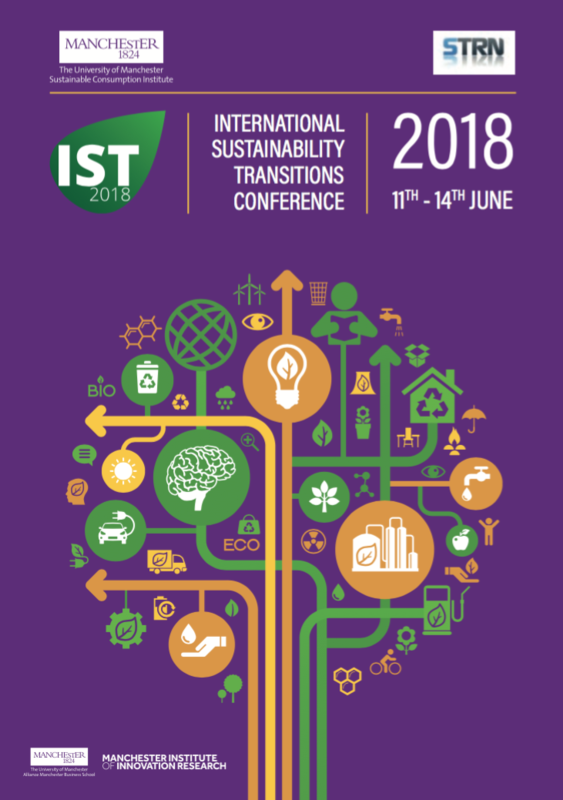 From 11 until 14 June 2018 transitions scholars and stakeholders from around the world met for the 9th International Sustainability Transitions (IST) conference in Manchester (United Kingdom). For almost a decade IST has been providing a forum for debate on all aspects of sustainability transitions research. At this year’s conference special attention was given to interdependencies between changes in technology, changes in business models and services, and changes in everyday life. Dr. Grit Martinez of Ecologic Institute spoke in a dialogue session about cultural conventions, system reconfigurations and transitions. Transitions research has long underlined that transitions are place-specific and context-dependent processes. i.e. their speed, direction and character can vary considerably in different geographical, societal and cultural settings. Despite this, there is still little generalizable knowledge about how cultural and other place-specific factors really matter in transition processes. Without thoroughly considering how place-specific factors influence transitions, it is difficult to understand and advance transitions in culturally different contexts. Embedded in the conference track 5 "Civil society, culture and social movements" the dialog session "The role of cultural factors in place-specific sustainability transitions" focused on cultural factors in sustainability transitions, on culture-related differences between regions and on how cultural issues should be dealt with in such a context. The aim of the session was to foster dialogue about these issues between researchers from different countries and disciplines. Among the istopics to be explored in the session were question about how cultural factors influence transitions in different contexts; how do they appear in different contexts and what cultural factors research can add to transitions research and transitions in practice. The session was organized through collaboration between research projects and groups approaching these issues in different contexts and ways. The research project "The frontier of sustainability transitions – cultural adaptations of sustainability policies in European peripheral regions" (conducted at University of Eastern Finland, UEF) invited researchers from three related projects: "Beyond GDP-growth - Scenarios for sustainable building and planning" (conducted at KTH Royal Institute for Technology, Sweden), INNOVA - Innovation for Climate Services Provision (project partner Ecologic Institute, Berlin) and the Common goods project (conducted at the Research Center of the Academy of Sciences and Arts, Slovenia). After impulse statements of researchers from the above mentioned projects several key points arose in the dialogue that followed amongst the participants. They span from cultural explanations of discrepancies between the natural conditions for renewable energy production and the political execution steaming from multi level perspectives referring to hierarchical and elitist tendencies (using the U.K. as an example) to request for better understanding of behavioral change/ cognitive dissonance and debates over empirical evidence usually steaming from micro-level field studies and the need for meta-level analysis and evidence in sustainability transitions research. Based on these discussions Ecologic Institute proposed to jointly develop a strategic paper outlining research needs for cultural factors and conventions and recommendations for sustainability transitions research amongst researchers from social science and humanities (SSH) and the environmental science and engineering.